A view of ARAS-WRI Research Station's Mississippian Period Garden on Petit Jean Mountain. There are Native Gardens at three Arkansas Archeological Survey research stations across the state: Toltec Mounds Archeological State Park, Parkin Mounds Archeological State Park, and the UA-WRI Research Station on Petit Jean Mountain. The plants in these gardens are species that have been found archeologically in Arkansas. These garden spaces were created to teach the public about Native American plant use in Arkansas prior to European contact. 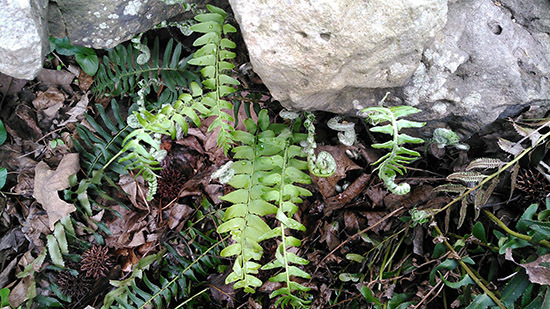 Fiddlehead ferns growing in the ARAS-WRI native gardens on Petit Jean Mountain. 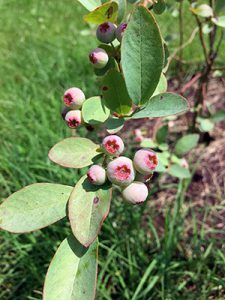 Eliiott’s Blueberries (Vaccinium elliottii), Plum Bayou Garden at Toltec Mounds. 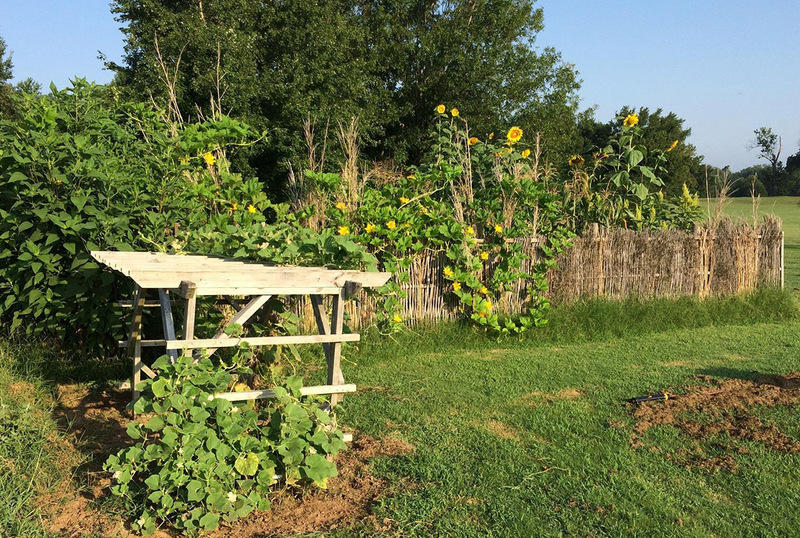 The Native American Teaching Gardens at the UA-WRI research station is a collaboration between the Arkansas Archeological Survey and the Winthrop Rockefeller Institute. First established in 2016, the Native Teaching Gardens at WRI include three different areas representing different plant procurement strategies used by native people in Arkansas. The plants in the Arkansas Native Plants Walkway area reflect wild plant food resources gathered by Native people beginning by at least 8500 B.C., such as hickory nuts, pecans, acorns, ferns, dewberries, blueberries, paw paws, maypops, and pokeweed. The plants in the Woodland Period Garden are similar to the plants found in the Plum Bayou Garden at Toltec, and include native plants of the Eastern Agricultural Complex that were cultivated and domesticated by 3,000 years ago. The Mississippian Period Garden showcases the agricultural plants used by people in the late prehistoric and protohistoric periods in Arkansas: corn, beans, and squash. These garden areas are designed to provide a hands-on experience for visitors to learn about what plants were used over time, how they were acquired and processed, and even what they taste like. The Mississippian Garden at Parkin Mounds was first planted by park interpreter Dr. Melissa Zabecki in 2012, and greatly expanded in 2014 with a grant from the Department of Arkansas Heritage. 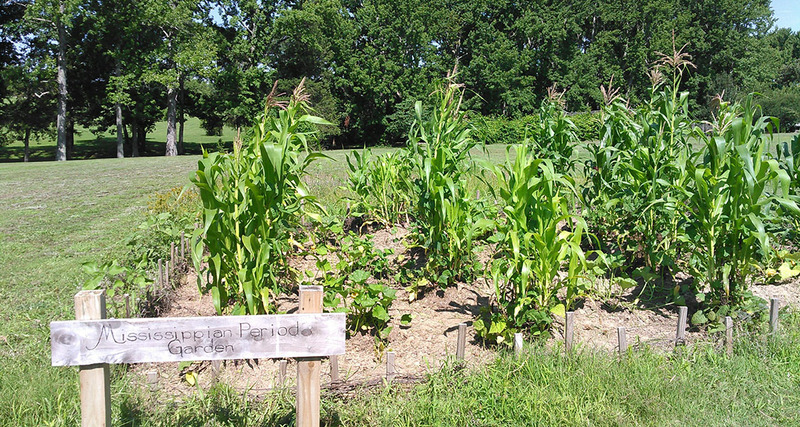 People living at Parkin Mounds grew corn, beans, and squash, sometimes referred to as the “three sisters.” These plants are featured in the Mississippian Garden at Parkin, along with other plants that were eaten during the time such as amaranth, sunchokes, and sunflowers. In addition to food plants, these three Native Gardens include plants that were used as fiber for making clothing, bags, and footwear. The gardens feature milkweed, dogbane, and rattlesnake master plants. 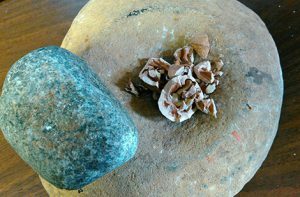 The inner bark of milkweed and dogbane were used to create cordage used in weaving cloth. The thick fibrous leaves of rattlesnake master were used for cordage as well. Parkin's 2017 Mississippian Gardens contained sunchokes, sunflowers, corn, squash, beans, and amaranth.